It’s been a tough year for the European project. 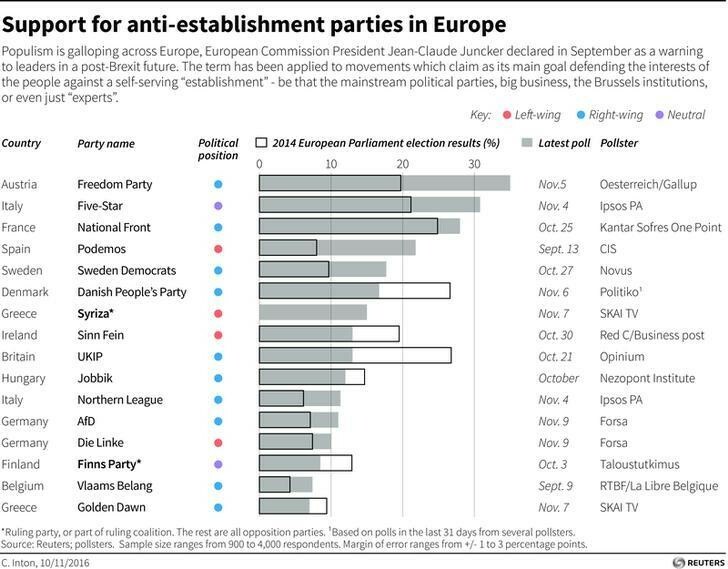 The success of anti-establishment movements such as the 'Leave' campaign behind Brexit, the 'No' vote in Italy's constitutional referendum, the rise of the French Front National, and the close-run presidential election in Austria are just some of the events highlighting discontent amongst citizens of the European Union. Across the continent, Europe faces “galloping populism”, as Jean-Claude Juncker, head of the European Commission, put it in a speech back in September -- an assertion backed up by opinion polls carried out across the bloc. So what is it that is driving Europeans into the arms of populist parties? According to a survey by Germany’s Bertelsmann Foundation , there is one factor more important to voters than a desire to return to traditional values or economic anxiety: fear of globalization. The survey, carried out in August, measured public opinion across 28 EU member states, and asked almost 15,000 people whether they viewed globalization – the process by which countries, businesses and individuals interconnect through trade, investment and technology – as a threat or an opportunity. 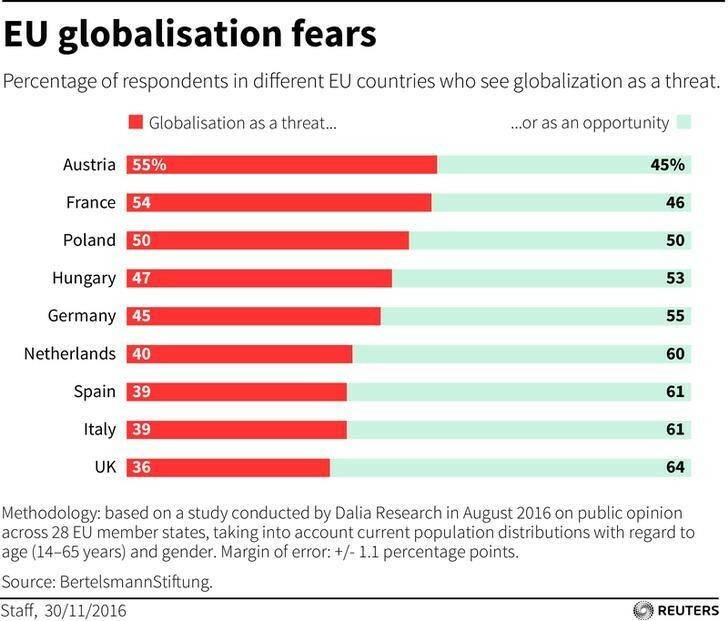 The results showed that this anxiety is most keenly felt in Austria and France, where 55% and 54% of respondents respectively said they viewed globalization as a threat (the only two countries where a majority of citizens voiced this opinion). France will hold a general election on 23 April 2017, and far-right candidate Marine Le Pen is one of the frontrunners for the presidency. In Austria, meanwhile, the far-right Freedom Party was narrowly defeated in the recent presidential run-off. 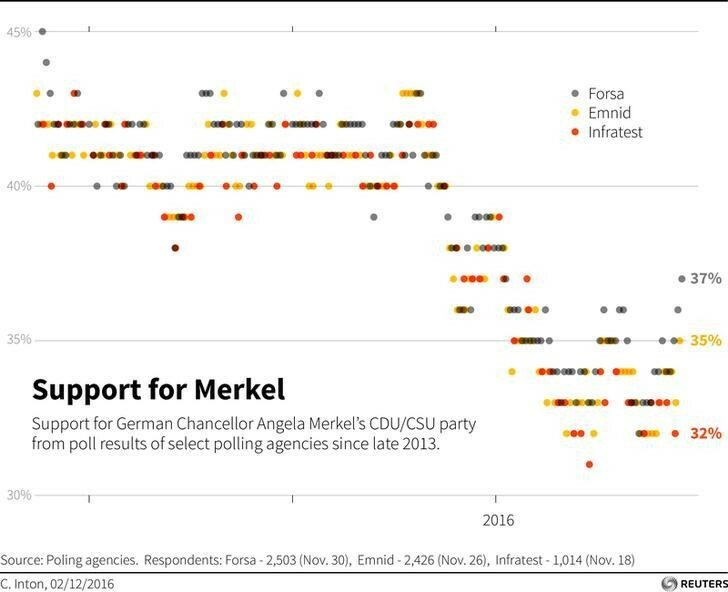 In Germany, where Chancellor Angela Merkel faces a populist backlash when she stands for a fourth term in federal elections next year, 45% of respondents said they viewed globalization unfavourably. Merkel’s decision to welcome more than a million migrants into the country has been linked to a surge in far-right extremism. The Netherlands (40%) also holds a general election in 2017, and Geert Wilders, leader of the far-right Freedom Party, is expected to perform well. Interestingly, just 36% of British citizens said they fear globalization, the lowest number among the nine major European nations. This is despite the vote to leave the European Union in June this year. The results of the survey are also seemingly at odds with events in Italy, where 61% of people said they view globalization as an opportunity. The rejection of Italian Prime Minister Matteo Renzi’s constitutional reforms was seen as a major victory for the anti-establishment movement. Across the 28 EU member countries, 45% of respondents said they see globalization as a threat, while 55% see it as an opportunity. "Europe has particularly benefited from globalization. Yet many people feel they have been left behind," said Aart De Geus, chairman of the Bertelsmann Foundation. The survey also asked whether people feel anxious about their economic situation. France (51%) was the only country where a majority of people said they do feel this anxiety, followed by Italy (45%). The least concerned? Brexit Britain, on 26%.